A ladies 80s costume is never going to look quite complete without a few accessories. One or two pieces of jewellery can work wonders on your 80s look, transforming it into a real head-turner. This complete neon jewellery set by Blue Planet Online is ideal for adding to your 1980s costume, and comes in five different colours. Try as I might, I could not find this item in the U.S. However, you will find a nice range of 80s Jewelry at Amazon.com. I also recommend searching for Neon Jewelry. You can't get more 80s than neon geometric shapes, and this set featuring squares and triangles fits the bill just perfectly. I remember very similar beaded necklaces and big, geometric earrings being worn by 80s pop star Cyndi Lauper. This picture should give you some inspiration for creating an authentic 80s style. 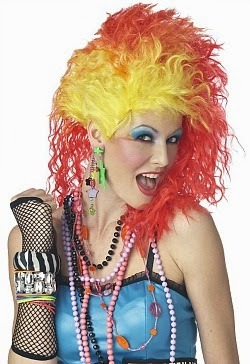 The fiery wig could be used to create a punk or Cyndi Lauper look. A stack of bangles, jelly wrist bands, faux pearl necklaces and dangle star earrings will create an authentic 80s fashion style, using a mix of clashing colours. Fingerless, fishnet/mesh gloves were also made popular by Madonna. I found these low-cost bracelets at Amazon. Just one of these could really give your outfit a lift. Sadly, I could not find this item at Amazon.com in the U.S., but they do stock a wide range of other 80s bracelets including neon and studded. 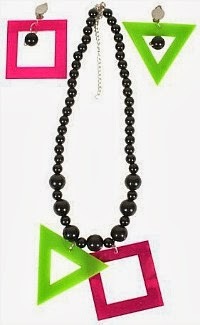 By far, the most popular 80s jewellery item on my website (simplyeighties.com) is this set of four neon necklaces; one pink, one yellow, one green and one orange. The customer reviews are excellent, and the price is low. These can also be bought at Amazon.com (U.S.). Here are the items at Amazon.com. The bead necklaces can only be bought in multi-packs and not individually, for some reason. Earrings were often over-sized and in neon colours like some of these below. Geometrical shapes such as stars and triangles, and animal print were popular in the 80s. Unfortunately, I could not find these items at the U.S. store or on ebay's U.S. site. These gorgeous dangle earrings can be bought at Amazon.com, but are not available at the UK store. I also tried eBay, but to no avail, sadly. I just adore these lightning bolt earrings. They're just so eye-catching, and they come in four colours. I could not find this particular pair in the UK, but there are lots of alternatives on ebay. Thisn handy set of 8 neon green items by Zac's Alter Ego (UK only) will save you the hassle of buying separate accessories. It includes a beaded necklace, 12 x gummy bracelets, hooped earrings, two leg garters, fishnet gloves, an alice band and shutter shades - what more could you need? 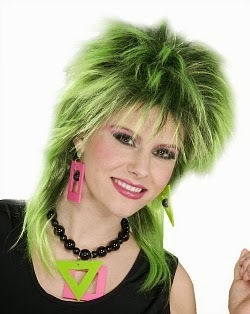 Although not available in the U.S., I recommend searching for 80s Accessories at Amazon.com which will give you more ideas.